Do we have any more room or iPad stands? It's getting crowded out there. We've seen just about every possible stand design made this past year. This iPad stand is a little on the unique side in terms of form and function. 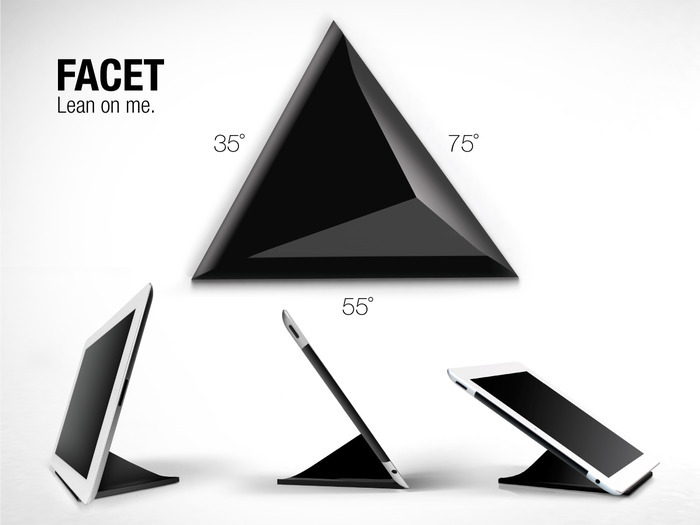 The Facet, is yet another Kickstarter product that has an interesting 3-sided pyramid concept style design which is quite versatile. It has three sides, each offers a different slanted angle ranging from 35, 55 and 75 degree angles. While this is definitely not the first stand of its kind to offer multiple viewing angles using opposite sides, the Facet does have some artsy charm.